Mt. Juliet City Hall is located at 2425 North Mt. Juliet Road, Mt. Juliet, TN 37122; phone: 615-754-2552. Photo: Warner Price Mumford Smith House, ca. 1853, 10277 Lebanon Road, Mt. Juliet, TN Listed on the National Register of Historic Places in 1993. Photographed by user:Ichabod (own work), 2014, [cc-by-3.0 (creativecommons.org/licenses/by/3.0)], via Wikimedia Commons, accessed May, 2016. As early as 1780, pioneers venturing from the east coast laid eyes on the area now known as Mt. Juliet when Michael Stoner explored Stoner's Lick Creek. 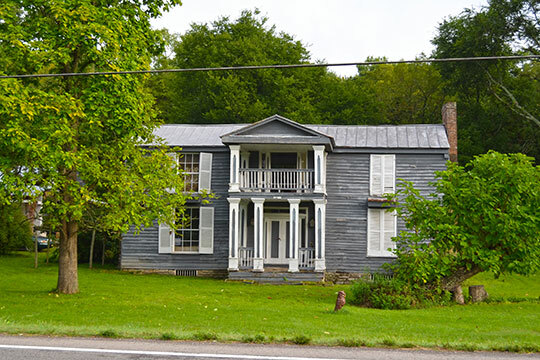 In 1800, the Eagle Tavern was operating on Old Lebanon Dirt Road, the main stage coach route between Lebanon and Nashville. It was located just east of the planning area on Old Lebanon Dirt Road. The original well can still be seen today. In 1835, the old Mt. Juliet town center was located on the hill near the intersection of Old Lebanon Dirt Road and Old Mt. Juliet Road. The mount overlooked the area that would eventually become the second town center when the railroad was constructed in the 1870's. By 1871, the town center moved to the railroad. The new town center was defined by 5th Street to the west, Mt. Juliet Road to the east, the Tennessee & Pacific Railroad to the south which is now Division Street, and the Tennessee Central Railroad built in 1888 to the north. The City flourished along the railroad. The town center included the Iron Horse, the first commercial building to move to the railroad, the Tom Willis Black Smith Shop, two grist mills, a one lane bowling alley, barber shop, Cedar Casket Company and other miscellaneous buildings. The Tilghman House, though it has had additions over the years, is one of the only original structures left in the planning area. It is rumored that it was visited by Andrew Jackson. The original part of the home faces Division Street where it once overlooked the livery stables and horse racing track. City of Mt. Juliet, Tennessee, Town Center Master Plan: Historic Context, 2004, www.egovlink.com, accessed May, 2016.